NanoBioTech-Montreux is a unique Conference at the frontiers of Micro- and NanoTechnology developments for Biological, Chemical and Medical applications. Presentations will explore the latest advances in the Lab-on-a-Chip and Microfluidics Fields. Focus at this conference will also be given to some of the many applications of Lab-on-a-Chip, from life science research, to taking diagnostics to the point-of-care/point-of-need and body-on-a-chip/organs-on-a-chip. 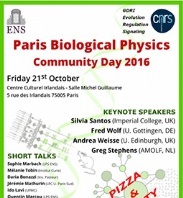 The 4th Paris Biological Physics Community Day (PBPCD 2016) is a conference organized by young researchers of biological physics in the Paris area. We aim to bring together researchers in biophysics in the Paris area in order to give them an opportunity to meet and share their knowledge. Attracting experts working in all areas of microfluidics, the conference will examine the latest developments in the technologies and techniques being used for progressing medical research, as well as the challenges and future of microfluidics. This international conference in honour of Liliane Léger is organized by the CNRS Research Network on Liquids at Interfaces. It will take place at the Pierre-Gilles de Gennes Institute in the center of Paris, France, from October 17th to October 19th, 2016. Registration is open until July 12th. The event is free of charges, including registration and meals. ADELIH (Association des Doctorants et des jEunes chercheurs de L'Institut d'Hématologie) is a French association founded in the early 2000's by three PhD students. Its aim is to federate all students and young researchers among their research institute IUH (Institut Universitaire d'Hématologie) through the organization of events. The Twentieth International Conference on Miniaturized Systems for Chemistry and Life Sciences (µTAS 2016) will be held at the Convention Center Dublin in Dublin, IRELAND from 9 - 13 October 2016.
µTAS 2016 continues a series of Conferences that are the premier forum for reporting research results in microfluidics, microfabrication, nanotechnology, integration, materials and surfaces, analysis and synthesis, and detection technologies for life science and chemistry. The Conference offers plenary talks as well as contributed oral presentations and posters selected from submitted abstracts. The ICFIA series since its first edition in 1989 in Orlando (USA), have been established as an international forum held every one or two years to discuss fundamental aspects and novel developments based on flow injection analysis and related techniques. The emphasis of the meeting will be focused towards developments in flow-based instrumentation, on-line sample treatment, new detectors, hyphenated techniques, miniaturization, and novel applications of flow injection techniques. It is the 230th meeting of the Electrochemistry Society. The conference will discuss the following topics: batteries and energy storage, carbon nanostructures and devices, corrosion science and technology, dielectric science and materials, electrochemical/electroless deposition, electrochemical engineering, electronic materials and processing, electronic and photonic devices and systems, fuel cells, electrolyzers and energy conversion, luminescence and display materials, devices and processing, organic and bioelectrochemistry, physical and analytical electrochemistry, electrocatalysis and photoelectrochemistry, sensors.